I confess. I'm a plant serial killer. I can't keep a houseplant alive for more than a couple of months, and I'm sick of smuggling their corpses out of my apartment when no one is looking. Until yesterday, I'd given up indoor gardening for good. Then I found this brilliant solution from a website called Vitamin Living. They offer the wonderful product shown above: the "I.V. Self-Watering Pot." It's lovely, and it should prevent unnecessary deaths. Plus, it will give your apartment/bedroom/jail cell that desirable emergency room atmosphere. UPDATE: One of our readers (thanks, Patsee!) has offered an ingenious suggestion. If you put red food coloring into the I.V. water it would look as though you're raising PLANTS THAT DRINK BLOOD! How fantastic would that be?!? That's the best suggestion ever! I'm going to revise the entry. Vampire house plants!!! AND, red dyed water might even turn some flowering plants slightly red or pink. And unnatural looking. Oooh! It reminds me of Almanzo Wilder feeding his pumpkin on milk. Fortunately (unfortunately?? ), my mom is amazing with plants, so we don't need something like that. It would look really cool, though! Ha ha. It's like you have a guest over and they see this beautiful plant sitting next to a lovely window drinking blood from an IV. And if it's somebody you don't know to well, they'll think you have pro-blems! Though I could totally sing "Somewhere That's Green"
hi,you know the fingertip in the icecream? well, I did a search on snopes.com, and the virdict is ...... FALSE!!! oh well. Ananka, you're very lucky you can keep your plants alive for a couple of months. Our ones die in around 2-3 weeks! I like the idea of the red food colouring - bloodsucker plants! Don't feel bad. My mom can make PLASTIC flowers start to wilt, no lie. I love that! 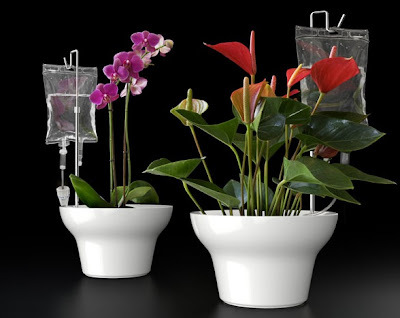 I'm kind of a plant killer myself, and I have *coughmentalcough* issues, so this would be perfect in my room! Where do you find these things? !